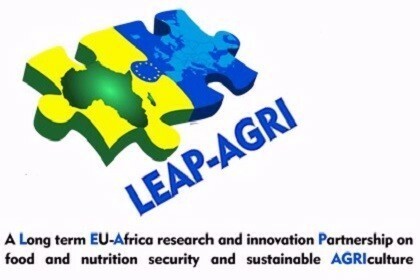 LEAP-Agri is a joint Europe Africa Research and Innovation (R&I) initiative related to Food and Nutrition Security and Sustainable Agriculture (FNSSA). 30 partners, including 24 Ministries and Funding Agencies (Group of Funders) from 18 European and African countries decide to join their forces and funding to build an ERA-Net Cofund project with a financial support of the European Commission. The project has two pillars, (i) funding R&I projects on FNSSA, and (ii) Feeding the long-term EU- AU partnership on FNSSA. The project start on 1st December 2016 for a 5 years duration. All 24 funding agencies defined the call for R&I projects priorities. The Call for R&I proposal on FNSSA has been launched on 15 March 2017 and 200 pre-proposals have been submitted. Based on an Independent Review Panel (IRP) () evaluation and ranking of the proposals, and in relation to the 24 Funding agencies possibilities, 27 projects were selected for funding by the Group of Funders. A total budget of 22,7 million € has been dedicated to the funding of the projects. The European Commission contribution (33% of the total budget) will be allocated to the funding agencies (on behalf French ANR, LEAP-Agri coordinator) so that they could fulfill their commitments related to the teams in the 27 selected projects. The 27 projects involve 250 African and European teams from 20 countries, and they cover a large range of thematic related to the Food system, as indicated in Annex 1. Each project involves at least two teams from African countries and two teams from European countries. Some project have much more participating teams including associated partners. Each national team in all 27 projects is funded by its national funding agency. Some European funding agency decide to contribute to fund of African teams. Projects started their activities on 1st September 2018, for a 36 months duration. Variability exists between projects and teams related to their start in relation to funding contracts preparation and signature.